Methylsulfonylmethane (MSM), also known as "DMSO2," is a crystalline DMSO-like compound that provides a naturally-occurring, low-toxicity source of organic sulfur, an important constituent of sulfated glycosaminoglycans that are vital for joint health. Diminished sulfur content in cartilage may lead to impaired maintenance of these tissues. Double-blind research has demonstrated that MSM is superior to placebo for helping to maintain long-term, comfortable function of joint structures. Emerging research suggests additional roles, including antioxidant protection, homocysteine-reduction, and support of normal upper respiratory function during seasonal pollen count elevations. OptiMSM™ is the industry standard for pure, high-quality MSM. 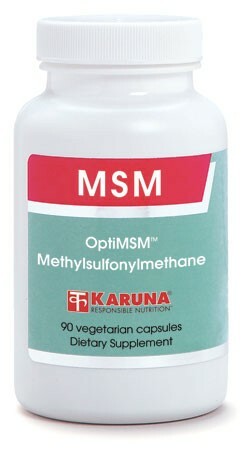 Refer to About... Methylsulfonylmethane (MSM). MSM may help maintain normal upper respiratory function during seasons when pollen counts are high (J Altern Complement Med 2002; 8:167-73). Human research has reported improved homocysteine metabolism and reduction of an indicator of oxidant stress among subjects taking MSM (Osteoarthritis Cartilage 2006; 14:286-94). Suggested use for adults: 2-3 capsules per day, or as directed.